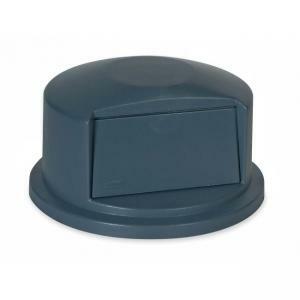 Dome-shaped lid is designed for Rubbermaid Brute 32 gallon waste containers (sold separately). All-plastic, professional-grade construction resists dents and will not rust, chip or peel. Lid snaps on easily and offers secure, stable stacking. Self-swing closing door allows easy trash disposal while keeping odors in and insects out.